One of the things that came to mind when I knew I was going to study in Valencia, was the great opportunity I was going to have of going to a life “tablao flamenco” performance, (a tablao is the place where flamenco shows are performed). For me this is of a supreme importance because since I was a child I used to go with my family to see these performances very often. In Cuba there is a huge flamenco movement and it is a big part of its culture. My sister started to study and practice these dance at the age of 7. Evidently, every show she would participate in all our family was there seeing her perform. 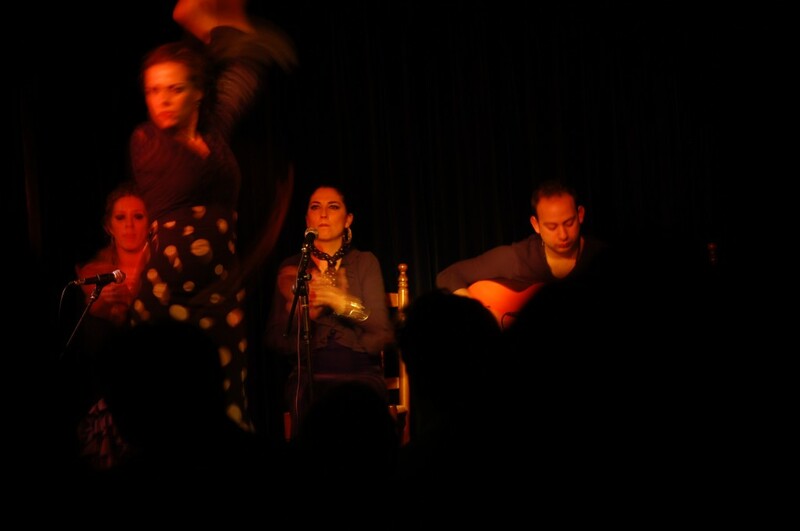 The passion for flamenco did not abandon her, and she continued on this journey until we left the Island. This culture grew up within me, and I grew up seeing my sister leaving her soul and love in a piece of plywood that my dad used to laid on the floor so that the flamenco heels would not break the tiles of the floor and also because dancing flamenco on a bare tile floor could affect her spinal cord. My sister stopped practicing a little bit after we arrived to Miami. Unfortunately this type of art, as many others are not topics of interest and are not popular there. It was the 3rd day in Valencia. I was walking through the historic center, which is very similar to my old Havana, and I stumbled upon a billboard announcing a “tablao flamenco” that same day in a local restaurant at 11 PM. I did not think it twice. This was something I was waiting for more that 10 years. My girlfriend, who accompanied me in this trip for the first two weeks, loved the idea as well. The show included dinner at 9pm, and we were their punctual. Once the tablao began I could not do more than observe, enjoy. The show was composed of 4 individuals, two female dancers, one incredible female flamenco singer, and a very talented male flamenco guitarist. Describing what I saw would be more that unfair. I do believe in indescribable things. What I saw that night was one of them. It is always gratifying to see a culture keeping its traditions sane and intact. It makes me believe one more time that anything can be done. There is something I can say about that moment when I was appreciating what those people were doing. I felt I was not here, I felt I separated from planet Earth for a few minutes. My mind was flying too fast every where, and it was impossible not to see my sister dancing one more time.